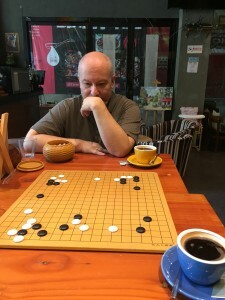 Down the street from our hotel Jeff Shaevel and I found the One Two Book Cafe, where we hoped to find good coffee to complement our otherwise local – and entirely delicious – culinary adventures here in Tongling. The cafe is also a bookstore and local hangout for young people to come and play games, on top of being a lovely coffeehouse. Jeff and I found ourselves there a couple of mornings when our schedule allowed, and were delighted – but not surprised – to find a Go set at one of the tables, on which he promptly trounced me two games in a row. 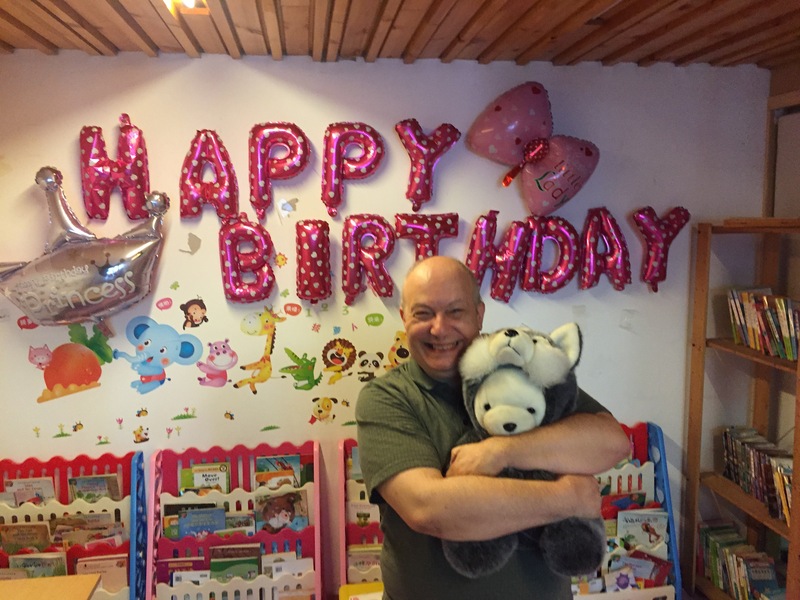 However, our time there was not only a celebration of Go and good coffee; a room at the back of the cafe is festooned with balloons and stuffed animals and is specially designated as the Happy Birthday room. 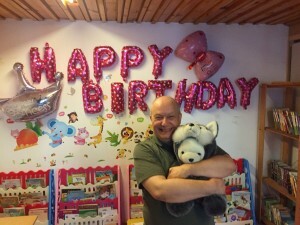 We looked no further for how to properly acknowledge Jeff’s recently under-celebrated birthday, which had begun only a few minutes prior to the boarding of our flight on Monday August 21 and as a result lasted only a few hours and was over by the time we landed. 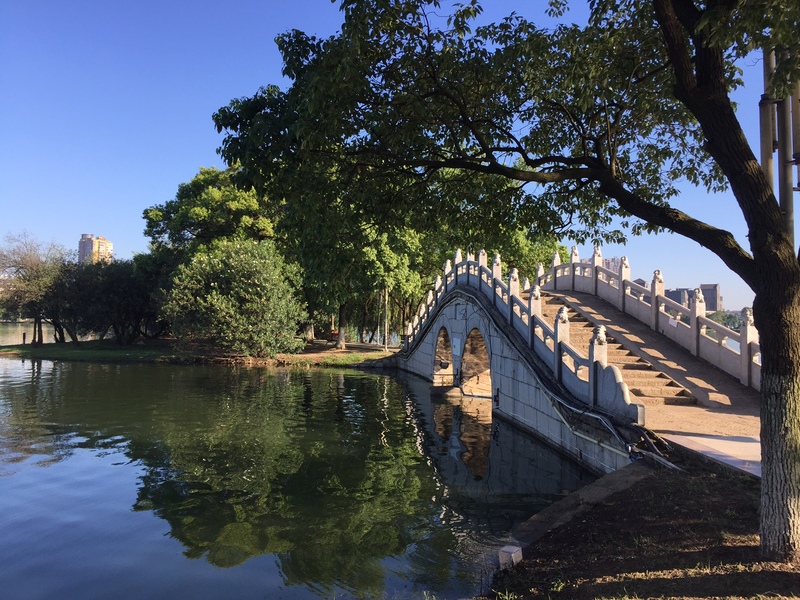 On Friday 8/25, the day off between the top 16 and top eight MLily Cup games, Jeff Shaevel and I were invited to accompany a delegation of professionals and tournament organizers on a student-centric trip around the city of Tongling. 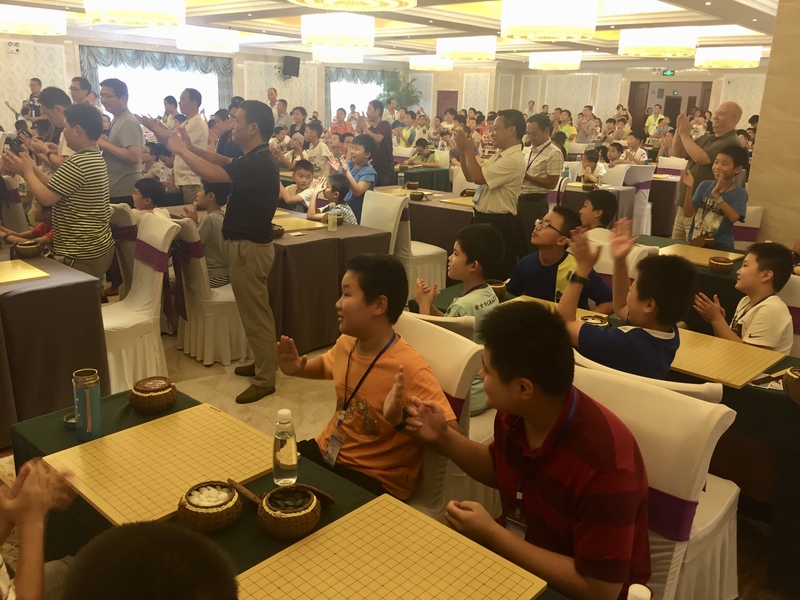 Members of the group included President of the Chinese Weiqi Association Wang Runan 8P, Vice President Nie Weiping 9P, captain of Chinese national Go team Hua Xueming 7P, and coach of the Chinese national Go team Yu Bing 9P. 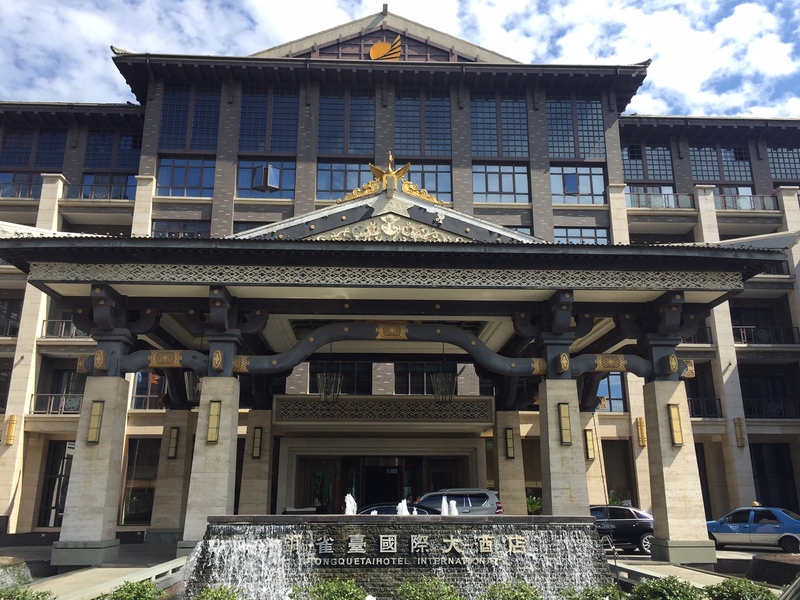 Our first stop was a hotel in the city where Anhui province’s student tournament was held. We were ushered upstairs to a tournament room filled with hundreds of young students sitting at Go boards (photo top right), who applauded enthusiastically at the entrance of the professional players. Wang Runan spoke to open the event, and amid more thunderous applause and the start of games, the pros and their entourage exited. Our second stop was at Ruilong Primary School, where Hua Xueming (photo top left), Wang Runan, and Yu Bing played simultaneous games with the students. The organizer of the event first introduced the professionals to the room, and welcomed Jeff and I as representatives of the AGA; a translator told me afterwards that Wang Runan had spoken of his pleasure that we were there and the positive communication happening between China and America through Go evidenced by our presence. 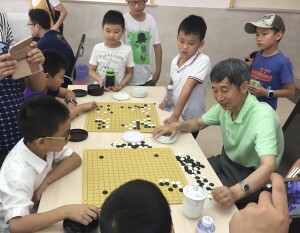 Then the children sat down at prepared Go boards, and each of the three pros took their places. 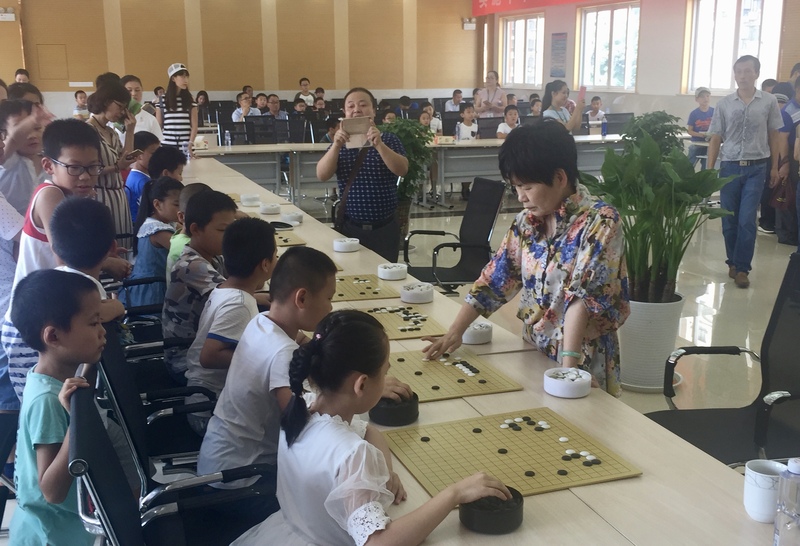 I spoke with one of the teachers in attendance, who let me know that most of the students were between six and eight years old, and all beginner level go players. 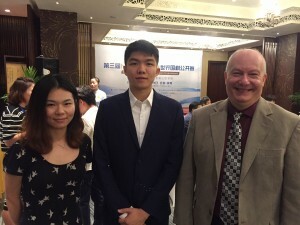 There were two empty boards on a table in the corner of the room, and when two students who had just come to observe asked Jeff for a simul, he happily obliged. 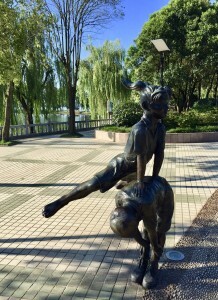 Their table was soon surrounded with the students’ friends watching them play, and parents taking pictures. 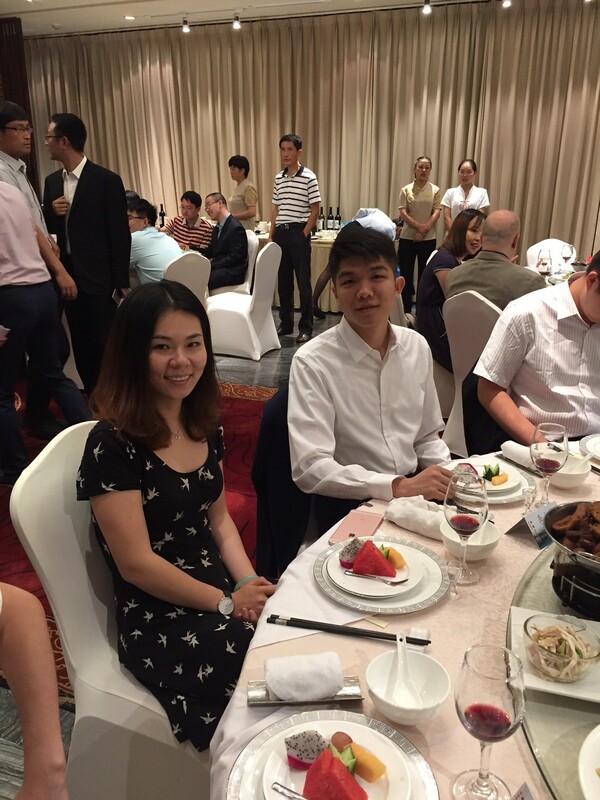 The enjoyment in the room, on the part of both the students and the professionals, was palpable at both events of the day. 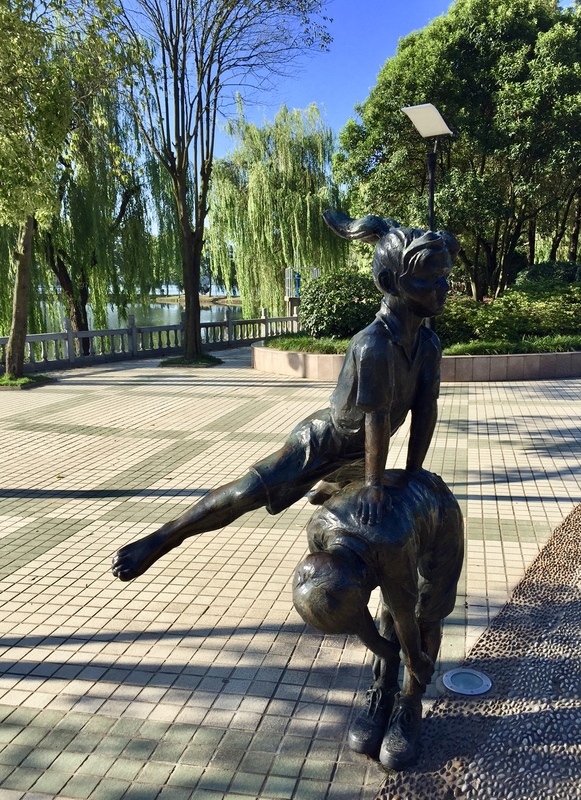 Seeing the way Go is treated by teachers and students in schools as an important and worthy activity was truly wonderful to witness. It made me feel grateful for the teachers in America who spend the time and effort to introduce Go programs in school and bring students into the game. 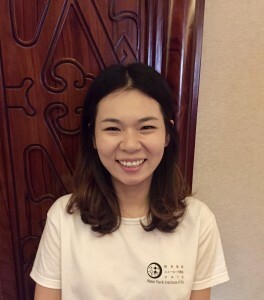 With the continued hard work of our Teachers of the Year, and all those who have not yet received the honor – but put in so many hours to teach Go to children and promote Go programs in Schools like the one Stephanie Yin 1P is introducing in New York City this year – perhaps one day we can have a student community of Go players in the US like the one that Jeff and I witnessed here in Tongling City. 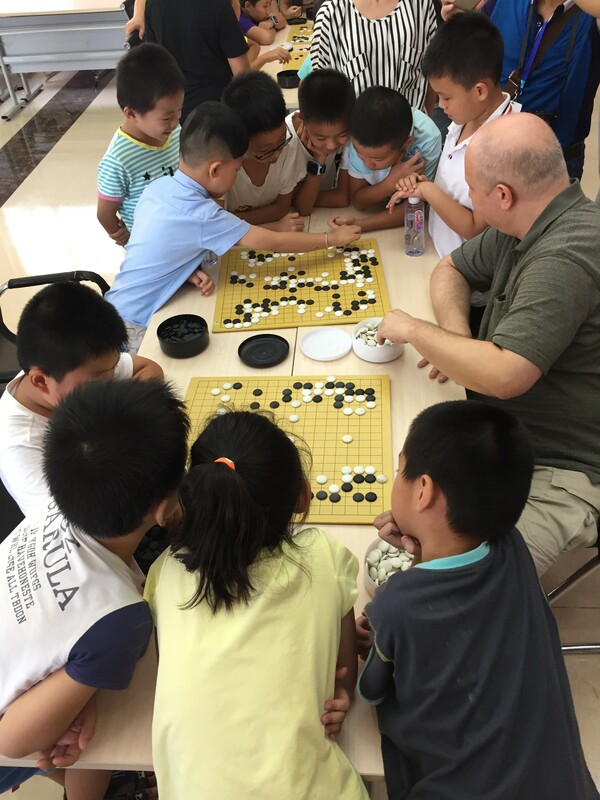 -photo (bottom left): Jeff Shaevel, AGA National Tournament Coordinator, plays a simultaneous game with two students while friends look on. Eight players, six from China and two from Korea, will face off in the next round of the MLily Cup on Saturday afternoon 8/26 at 12:30pm. 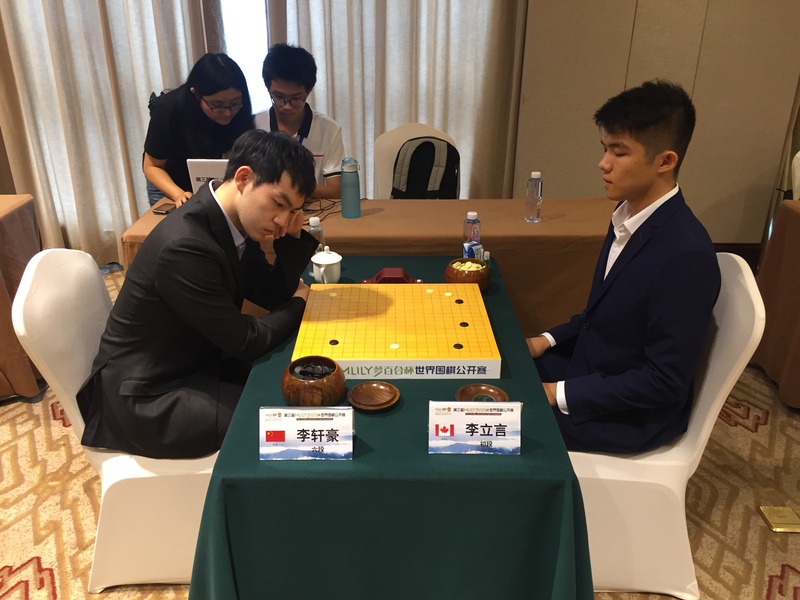 The strength of the young generation of Chinese professionals is evident in the results of the tournament so far; all of the Chinese players in the top eight were born after 1995. 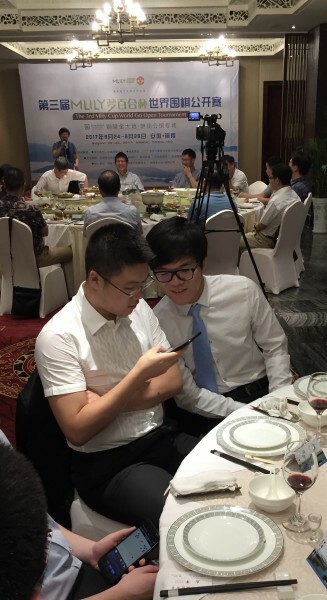 During the welcome dinner, many of the professional players including Ke Jie 9P (at right in photo left) reviewed games on their smartphones while the tournament and local officials kicked off the festivities with remarks and toasts. 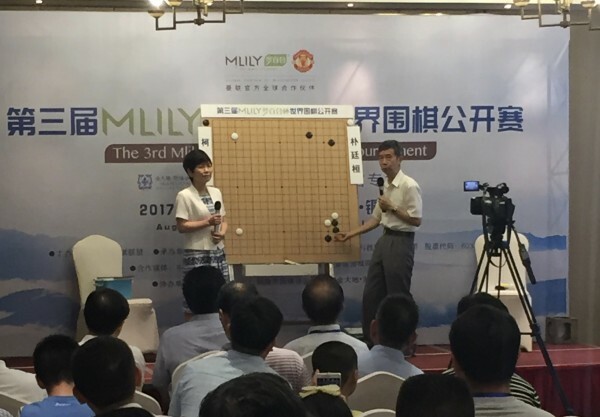 Ni Zhanggen (bottom left in photo at top right), CEO of MLily Furniture and sponsor of the MLily Cup, got a game in with Hua Xueming 7P (right), the head of China’s national go team, in the discussion room during the top 16 MLily Cup match. MLily Cup tournament director Liu Jing 8P looks on from the end of the table. 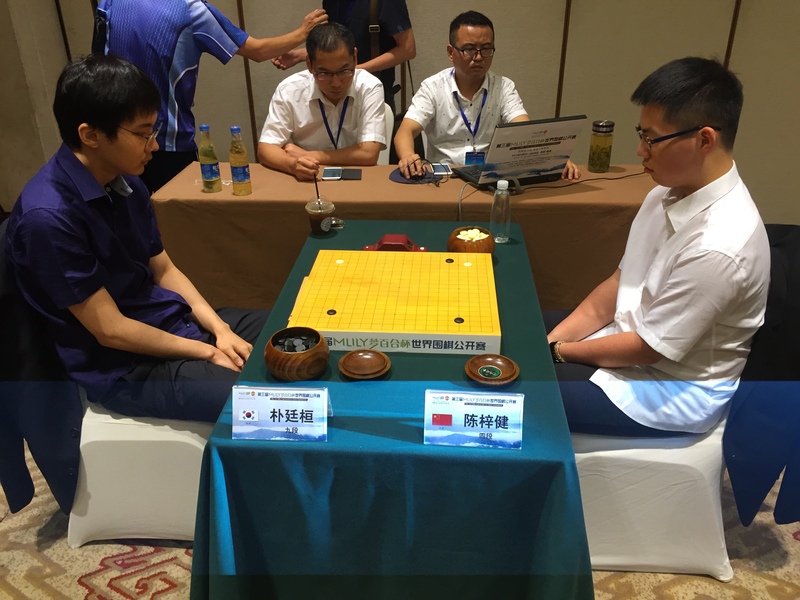 Hua Xueming 7P and Wang Runan 8P, President of the Chinese Weiqi Association, hosted the public commentary of board one, Park Jungwhan 9p vs Ke Jie 9p (photo bottom right). 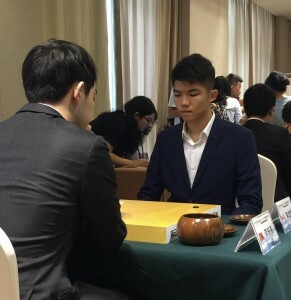 Ryan Li 1P has begun his match against Li Xuanhao 6P (photo) in the top 16 of the MLily Cup in Tongling City. 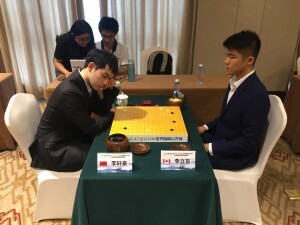 Check out live coverage and commentary on Twitch and Youtube to follow his game.